The DW series is SPX's latest technology rotary lobe pump range. No other rotary lobe pump on the market today offers such a wide range of features in one pump. The 26 DW models are hygienic, 3-A and EHEDG approved and cover all requirements from 3 litres /100 revs to 1016/100 revs. Maximum pressure up to 30bar. All product contact parts are AISI 316L stainless steel and elastomers comply with FDA-requirements. This is designed for outstanding efficiency. Internal clearances have been minimized so that a smaller pump size can be selected for medium viscosity applications. 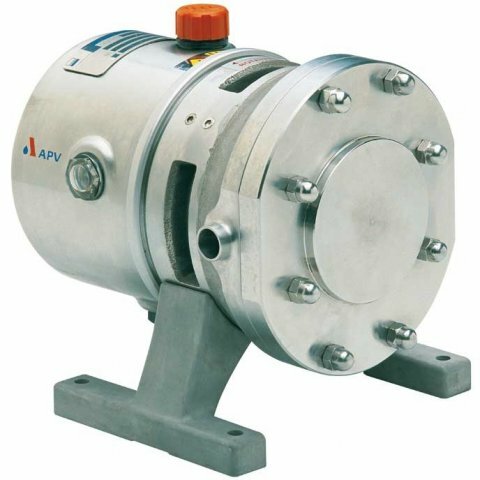 The APV PUMA+ series comprises 3 basic pump configurations offering heads up to 7.8bar (50 Hz) and flow rates up to 135 m3/h (50 Hz), and is suitable for system pressures up to 16 bar. The DW series is SPX's latest technology rotary lobe pump range. No other rotary lobe pump on the market today offers such a wide range of features in one pump.